Photograph of Lucia Joyce Dancing by Berenice Abbott. Image via Getty. “Her case is cyclothymia, dating from the age of seven and a half. She is about thirty-three, speaks French fluently,” James Joyce wrote in a 1936 letter concerning his daughter, Lucia Joyce. “Her character is gay, sweet and ironic, but has had bursts of anger over nothing when she has been confined to a straitjacket.” The letter contained one of Joyce’s most straightforward descriptions of his youngest child—straightforward and direct—and yet, the simple recitation of facts cuts deep. Here is, too, one of the fullest portraits of Lucia that exists. Lucia was the much-loved daughter of a writer so influential and revered that he’s celebrated annually; she was cultured, and, by the age of 33, she was familiar with the fit of a straightjacket. From Joyce’s letter we catch a glimpse of a woman who was born, it seems, solely to disappear, hidden by histories that have conspired to render her absent. When Joyce wrote the letter, he was requesting more money from his benefactors; by 1936 the family was spending nearly 2,700 francs on Lucia’s care. That year, Lucia had been institutionalized in an asylum in Ivry, a suburb of Paris. The large sum was no doubt a drain on the spendthrift Joyces, and they had been making similar expenditures on Lucia’s health care for nearly four years. By the age of 33, Lucia had already done a tour of European asylums—she had been a short-term resident in the asylums of Nyon, Zurich, Dublin, Paris, Prangins, and Northampton, to name just a few. She had been subjected to a range of treatments from bovine serums to injections of seawater, isolation, and seemingly endless blood tests. By 33, Lucia had also set fire to rooms, attacked her mother Nora Barnacle, sent telegrams to the dead, spent time with Carl Jung, and disappeared for days. Lucia Joyce dancing at the Bullier Ball in 1929. Image via Harry Ransom Center/Wikipedia. 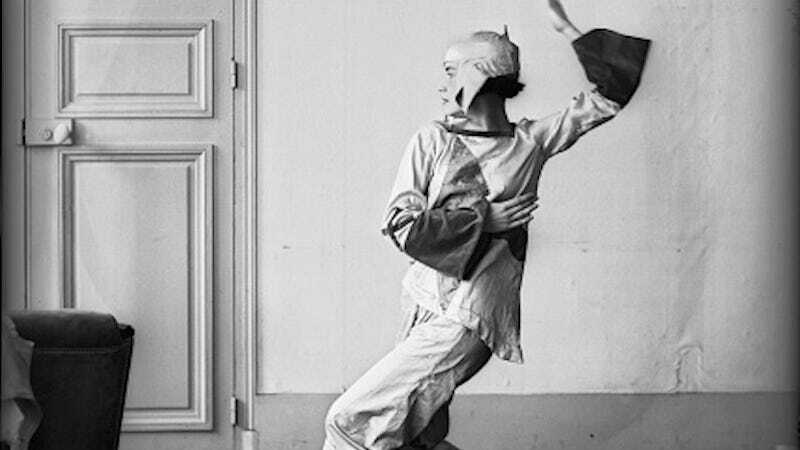 And yet, she had also been a dancer, had studied with Raymond Duncan (the brother of the also tragic Isadora Duncan); her modernist “will o’ the wisp” dance had been captured by the lens of Berenice Abbott. She had also appeared in one of Jean Renoir’s films. But by 1932, the bohemian daughter of Joyce—the woman who Thomas Wolfe had once confused for “a little American flapper”—had virtually disappeared, committed to institutions, consumed by treatments, and bound in straitjackets. That Lucia would never reappear. After she was committed at Ivry, she would never again live outside of care, dying in an English asylum in 1982. The life of Lucia Joyce is, in one sense, easy to trace. Facts about her abound and are well documented: She was born in a pauper’s ward in Trieste, Italy; she was the only daughter of James Joyce and Nora Barnacle, one of the 20th century’s most examined couples; she lived across Europe, following her peripatetic parents from grand hotels to shabby apartments depending on their financial status at the moment; she studied dance until she was 22; and, by 28-years-old, she consumed the letters of her family—as well as Joyce’s circle—who each fretted over her illness, disagreed on whether or not she was insane, but all agreed that she was a problem. But even as I write those facts, Lucia seems to slip further and further away. Despite her outsized presence in Joyce biographies and even one unconvincingly argued biography on Lucia herself, she is only accessible as a series of literary tropes, the kind specifically reserved for mentally ill women. She exists as a series of images that make the mad woman accessible and yet force the actual woman—her pain or realities—to disappear. Lucia has alternatively been reconstituted into images: she is the troubled daughter of a great man, the tragically insane young woman, the unsung muse of her father’s genius, a young woman whose whimsical charm was misinterpreted as insanity, a victim locked away by a conspiring, jealous family or a perfectly sane woman whose symptoms were the invention of the patriarchy. Each of these ring hollow—they are each familiar literary tropes, but no real flesh and blood woman has the plasticity to conform to them. The images of Lucia stand in place of the woman, consumed as she has been by conspiring forces of histories of medicine and great men to erase her. Nearly all of Lucia’s letters are missing, either destroyed or lost and what little remains is unpublished, hidden in archives. Her nephew, Stephen Joyce, also worked to make her disappear; Lucia’s biographer Carol Loeb Schloss writes that he removed his aunt’s publicly accessible letters from a collection he gifted to the National Library of Ireland. And Stephen, notoriously litigious over his grandfather’s estate, sued Schloss forcing her to remove information from her biography (Schloss was ultimately vindicated years later, but the damage was done). That’s the practical, archival history that has forced Lucia’s disappearance. But lurking beneath the postscript of Lucia’s life—estates and archives—is the asylum. Most of the writing that remains about Lucia (other than possible references to her in Joyce’s highly autobiographic novels) are letters about her illness. In them, she is forced to take up residence in what Susan Sontag once called the “kingdom of the ill,” “landscaped” by metaphors. In this kingdom, Lucia’s symptoms are described in evasive terms that circle around mental illness but resist naming it as such—she has a “condition,” she is rattled by “nerves,” she is “troubled.” Lucia’s illness cannot be named and her pain can only be described as a series of clinical or baffling symptoms, left open to interpretation by the letter writer. Even then, Lucia is represented in the margins of those letters, there is no cohesive way to write or speak of her because the asylum, particularly its female inhabitants, resist literalness. Even Schloss resists naming, writing that Lucia, “did not know if she had a condition or lived according to a private set of countercultural values.” In seeking to reconstitute Lucia, Schloss see only resistance and minimizes real pain. But it also functions as a medical metaphor, a place where narrative is fractured and women are rendered intelligible. Indeed, the asylum so large that it’s impossible to write any history of women without the asylum; without also the sanatorium, the Maison de santé, the spa or the rest cure, without whatever label, genteel or otherwise, used to describe a mad house. And yet ironically, in rendering women invisible, in reducing them to metaphors of insanity, the asylum makes the lives of women—not the ghosts that haunt letters and novels but real, living women—virtually impossible to reconstruct. That is, ultimately, the story of Lucia. The Joyce Family. c. 1920s. Lucia entered her first asylum in 1932 after throwing a chair at her mother during Joyce’s 50th birthday party. There had been signs before that she was troubled—an April “tantrum” at the Gare du Nord train station followed by nine days in bed and violent fights with her mother. But the February party was the breaking point. Some have attributed the breakdown to Samuel Beckett who, in 1930, had ended his casual relationship with Lucia, drawing the ire of her father. Beckett had been welcomed back to Joyce’s circle and invited him to his party. Lucia, some suggest, was upset by her family’s betrayal, but that story seems to give too much power to Beckett, emphasizing the power of great men over the behavior of women. In September, Joyce removed her from the asylum, apparently against the wishes of Nora and Lucia’s brother Giorgio. Joyce was upset after visiting her; he didn’t seem to care that a few days earlier she had set fire to a table. That year, Dr. Henri Codet met with Lucia and declared, “there is not much the matter with the girl, and that, whatever it was, she would soon get over it.” His diagnosis was contracted in May 1932 by Dr. Gaston Maillard, who named “hebephrenic psychosis” the problem. The diagnosis, a synonym now for schizophrenia, was the first of many times she would be labeled schizophrenic. That same month she would enter Maillard’s clinic in L’Haye-Les-Roses. It would also be when Lucia officially lost her legal status as an adult, surrendering it to her doctor. Joyce removed her from Maillard’s care in July, establishing a familiar pattern. By 1933, Lucia is in the care of Dr. Bertrand-Fontaine, who says there’s nothing wrong, but by later that year she’s with a Dr. Vignes, taking shots of sea water for reasons unknown. By July, she’s moved to the Burghölzli clinic of Dr. Hans Maier, who dubs her neurotic; a few months later, she moves to Prangins in Nyon to see Dr. Otto Forel. After seven months, Forel is unable to diagnose her condition but there, she’s kept “under restraint,” behind barred windows and constant supervision. Joyce intervenes again and removes Lucia, telling Carola Gideon that if Lucia stayed, she would “simply fade out.” But perhaps she already had. Photograph by Berenice Abbott. Image via Getty. Image before 1922. After Küsnacht, Lucia’s deterioration seems to become more rapid. In Bray, Ireland, staying with Joyce’s sister Eileen, Lucia starts fires, sends telegrams to dead people, and disappears for six days. When Eileen writes her brother to flag her concerns over Lucia’s “scenes,” Joyce responds by dismissing her claims, saying that Nora (who, by this point, has washed her hands of her daughter) experienced far worse for far longer. In 1936, Lucia goes to England, where she’s placed under the care of Dr. MacDonald. MacDonald also diagnosed her schizophrenia but because there was no standard of care for the disorder, he bans sedatives and gives her injections of a bovine serum, believing that the disorder was glandular and not somatic. The bovine serum does nothing to help Lucia and instead her behavior becomes more destructive, there are more suicide attempts and MacDonald decides to move her to his hospital, St. Andrew’s in Northampton, a sad foreshadowing of her future. Joyce refused to let his daughter stay in England and so Lucia is sent to the home of Maria Jolas, a member of the Joyce inner circle. The stay does not go well and later that year she is taken in a straitjacket to the sanitarium of Dr. Francois Achille Delmas at Ivry. It’s Delmas’s diagnosis that Joyce cites in the letter, “cyclothymia,” Joyce wrote, a mental disorder that mimics schizophrenia but without its duration or intensity. After Joyce’s death, guardianship of Lucia was transferred to Joyce’s longtime patron Harriet Weaver and, in 1951, Lucia was transferred St. Andrew’s in Northampton, England, where she would remain until her 1981 death. There are a few mentions of her after the move to England. Every once in a while an intrepid journalist would show at St. Andrews, looking to speak with the daughter of James Joyce or, more likely, happily stumble upon her when they were interviewing Violet Gibson, the Dublin woman who shot Benito Mussolini in 1926. Like Joyce, she spent the majority of her life locked in an asylum. But otherwise, Lucia had disappeared. The sad irony is that Lucia was gone long before she died, invisible to the outside world that had largely forgotten about her even as they remembered her father, celebrating Bloomsday every June 16. But then, what is there to say about Lucia? She faded into images decades ago, it’s impossible to resurrect her; it’s how the asylum works—Lucia is evidence of its effectiveness. Even though the history of literature is filled with novels and essays and memoirs about the asylum, many of which were written by women (Virginia Woolf, Leonora Carrington, Sylvia Plath, Charlotte Perkins Gillman, and Alice James), those works are unusual. The author remains decidedly present, decidedly in control of the narrative. Lucia is more typical of how illness and the asylum conspire to render women invisible; how it turns them into ghosts that haunt pages and cultural imaginations. Women like Lucia Joyce are the reason the haunted asylum still holds such cultural sway because hundreds of thousands of women disappeared in these institutions, never to be seen again.